If there’s one lesson labor can draw from the events of 2017, it’s this—to survive and grow in the face of a nationally coordinated employer offensive, we’ll have to use the attacks against us as organizing opportunities. Everywhere you look workers are either on the defensive or just plain getting crushed. Take anti-union “right-to-work” laws, which weaken union strength and budgets by giving workers covered by union contracts a short-term financial incentive to opt out of membership. Since Kentucky fell in January, the entire South is right-to-work. Such laws cover much of the Midwest and West too, a total of 27 states. A February law put Missouri on track to become number 28—until unionists blocked it from going into effect by collecting an astounding 310,567 signatures for repeal. The question will appear before voters on the November 2018 ballot. Look to Iowa for another example. An awful law passed in February—the state’s own version of Wisconsin Governor Scott Walker’s notorious anti-union Act 10—defangs public sector collective bargaining and requires unions to win a reauthorization vote every contract cycle. But unlike in Wisconsin, where the law has decimated public sector membership, Iowa unions so far are gamely clearing the hurdles. This fall saw the first two rounds of elections, where 462 of 494 affected locals won their recertification votes; 29,552 people voted to stay union, and 651 against. What it took was shoe leather: members coordinating their efforts to talk to each co-worker and track who’d been reached. Some schools got 100 percent of teachers to vote. A mobilization on this scale is no small feat—but reaching every member a year before your contract expires isn’t a bad idea anyway. Done right, rising to the challenge can be a union-building opportunity rather than a drain on resources. It looks like making lemonade is going to be the name of the game for a while. The appointment of Neil Gorsuch to the Supreme Court in April nearly guarantees an anti-union decision in Janus v. AFSCME next year—which means the equivalent of a right-to-work law will hit the public sector nationwide. Unions are scrambling to prepare, but often focusing their energies in the wrong place. Some unions, anticipating the budget crunch, are planning to make do with less—looking for salvation in mergers and consolidation, or cutting expenses at headquarters. Some are pursuing a marketing strategy to keep members on board—training staff and stewards to sell the union as a “brand,” or emphasizing perks like discounted movie tickets or more substantive benefits like legal defense and professional development. On their own, these approaches are bound to fall short. 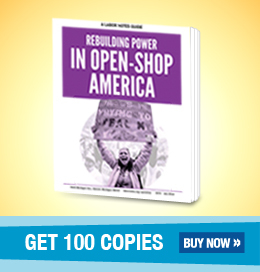 The unions that build power in open-shop America will be the ones that fight hard on workplace issues their members care about and activate large numbers of rank-and-file members in their own fights. It’s what unions should be doing anyway, but the reality is, for many sleepy locals and internationals, it will require a huge transformation. As the Trump presidency kicked off this year, labor polarized along with the rest of the country. Union members were among the millions who marched in protest against a woman-hating, immigrant-bashing president and packed airports to oppose the Muslim ban. Some unions lined up on the side of resistance, and a handful even held inauguration-day strikes. But others began the year with the sobering realization that nearly half their own members had voted for Trump—reflecting anger at a political establishment that ignores working people’s concerns, along with an apparent willingness to overlook or even endorse Trump’s blatant racism. The best national programmatic response to this problem came from the Communications Workers, who are using a member-to-member training called Runaway Inequality to develop a shared analysis of who’s to blame for workers’ economic woes and what must be done to change the balance of power. Trump and Congress packed the year with bad news. Anti-union control of the Labor Board and Department of Labor threatens to roll back Obama-era progress on quicker union elections, subcontracted and franchised workers’ rights to bargain with their real employers, the misclassification of employees as independent contractors, permanent replacement of strikers, and organizing rights for graduate employees. Despite union protests, charter school proponent Betsy DeVos became Secretary of Education. A few political bright spots: Odious fast-food executive Andrew Puzder withdrew his nomination as Secretary of Labor—chalk up that win to restaurant workers’ protests and pickets. The scrappy union of campus workers in Tennessee defeated their billionaire governor’s privatization plan. And a bipartisan network of self-organized Teamster retirees has made headway towards a Congressional solution to their pension crisis with the introduction of the Butch Lewis Act. Health care horrors continued, with repeated attacks on the Affordable Care Act and renewed threats against Medicare, Medicaid, and Social Security. Meanwhile Bernie Sanders’ single-payer plan has been gaining steam, attracting a number of mainstream Democrats as co-sponsors. The Trans-Pacific Partnership is off the table, thank goodness. But any workers hoping to benefit if Trump renegotiates NAFTA are engaged in wishful thinking—as were the Building Trades leaders who cozied up to the president over vague promises of infrastructure jobs and the Auto Workers leaders who jumped on board with his “Buy American” campaign. Remember, Trump is the man whose idea of bringing good jobs to the U.S. is forking over billions in tax breaks to open a Wisconsin outpost of Foxconn, the company notorious for worker suicides at its iPhone factory in Shenzhen, China. Democrats aren’t much better—Chicago Mayor Rahm Emanuel, for instance, offered $2 billion in tax breaks to Amazon for its second headquarters location. At press time Congressional Republicans were pushing a terrible tax bill, an unapologetic giveaway from working people to the super-rich. The bill is wildly unpopular, even in red states—it raises the deficit despite canceling tax breaks for medical bills, union dues, homebuyers, people hit by natural disasters, and even teachers buying school supplies for their students. We hope the backlash in November’s election results and the popular anger at this brazen tax bill mean Trump’s false populism is losing its allure. Workers lost big organizing drives at Boeing, Nissan, and the Fuyao auto glass plant. There were a handful of wins, however—for graduate employees at the University of Chicago, nurses at a large hospital in northern Michigan, and Familias Unidas por la Justicia, the independent union of Washington berry pickers, which finally secured union recognition and a contract. After a long campaign that included firings and repeated wildcat strikes, that win was especially sweet. Still, as our numbers shrink, anti-union forces are licking their chops for the kill. And that meant at contract time, workers with existing unions were fighting the odds. The more isolated we get in a sea of non-union shops, the harder it is to make gains or even defend existing standards. Two-tier keeps proliferating; wages and benefits keep declining; speed-up and workloads keep getting worse. The situation isn’t helped when some union leaders take a defeatist attitude and offer up concessions, as one rail union coalition did in bargaining over health care with the nation’s top freight carriers this fall, while another rail union coalition picketed with the slogan “Health care, not wealth care!”‘ The grassroots insurgency Teamsters United is already organizing for a no vote on the bad deal members see coming down the pike next year at UPS. The elements of a winning contract campaign in 2017 were the same as ever: engaging a majority of members in an escalating series of actions and building to a credible threat to strike. Good examples included nursing home workers in Illinois who won an average raise of $3 an hour; transit workers in right-to-work Virginia who won big raises and bathroom breaks and raised membership to 85 percent; and library workers in New Jersey, who won a $15 minimum wage and raised membership from 65 to 93 percent. The nursing home and transit workers both came to the brink of strike, while the library workers chose a different peak tactic that struck fear into their boss’s heart: no one signed up to “volunteer” for the annual book sale. In Ontario, 2,800 auto workers at General Motors’ CAMI plant ran up against the limits of acting alone when they walked out for job-security language. Their robust strike stopped production and cost the company millions. Still, after a month they walked back in without winning their top demand. Recognizing those limits, some unions were wise to team up with the public or with other locals who share the same employer. For instance, despite their unions’ warring factions, rank-and-file rail freight workers in Kansas City formed an All Crafts Coalition. After the group held a rally against concessions, its next meeting tripled in size. Seventeen thousand AT&T Mobility (wireless) workers teamed up with 21,000 AT&T West wireline workers for a three-day walkout, the year’s biggest U.S. strike. A half-dozen teacher locals in California began coordinating their contract campaigns, linking them to statewide funding demands. Portland transit workers and riders together pushed for safety measures that would benefit both. Next year we hope to see more of these green shoots. Events late in the year highlighted the need to get labor’s own house in order. Corruption scandals racked the Teamsters and the Auto Workers, where high-up union leaders are accused of using their positions to line their pockets. Other kinds of misbehavior by union leaders are far more common—from drawing double salaries and pensions to becoming apologists for management’s point of view. Such misleadership plays into the hands of anti-union forces, undermining unions’ legitimacy in the eyes of members just when it’s needed most, as right-to-work propagandists push members to quit the union. The solution isn’t to sweep these problems under the rug but to sweep them out. In a similar vein, the Harvey Weinstein scandal has sparked a long-overdue cleaning of house in a number of workplaces, including union staffs. Every time such a man is removed from a position of power, it clears the path for women in his workplace. But the biggest changes needed in our unions and workplaces will come not from public scandals or government interventions, but from members organizing themselves. When Nashville bus driver Patrick Green and his co-workers were frustrated that they never saw their union contract before voting on it, they had the right idea—they ran for office on a platform of transparency and member participation, and won. Members got to read the next contract before voting. That might sound small, but we won’t get far until we get these fundamentals right. And in a right-to-work state, membership in Green’s local jumped up from 60 to 80 percent. Finally, despite a series of awful developments, all year long we were inspired as workers turned their fury into action on the job. Many pinpointed the concrete ways that large-scale problems were playing out in their own workplaces, and started there. Quarterback (and union member) Colin Kaepernick launched the year’s highest-profile workplace action when he knelt on the football field to support Black Lives Matter; hundreds of other players soon followed suit. Kaepernick has since filed a grievance against the National Football League for retaliating against him. To oppose the Muslim ban that stranded refugees at airports in January, taxi workers jammed up Kennedy airport in a one-hour strike. Tens of thousands of workers joined a grassroots strike in February, the Day without Immigrants. Teachers in St. Paul, Los Angeles, and Massachusetts organized demonstrations at schools to make their immigrant, Black, and LGBTQ students welcome. In November 150 furious lawyers stormed out of a Brooklyn courthouse together after a defendant in the middle of his court hearing was detained by immigration enforcement. And in Germany over the course of the year, pilots prevented the deportation of 222 asylum seekers, mainly to Afghanistan, by simply refusing to take off. Labor still has the power to throw sand in the gears of exploitation. The next step is for all these disparate troublemakers to start seeing their workplace struggles—from defending pensions to defending refugees—as part of the same bigger movement. That’s the role Labor Notes plays, and it’s one reason we were excited that our Secrets of a Successful Organizer book and training materials took on a life of their own this year, even zipping around the world. Contrary to Margaret Mead’s famous words, changing the world requires action not just by a small group, but by large numbers of thoughtful, committed people. Two thousand of these world-changers will converge on Chicago next April for the 2018 Labor Notes Conference. We’ll see you there.